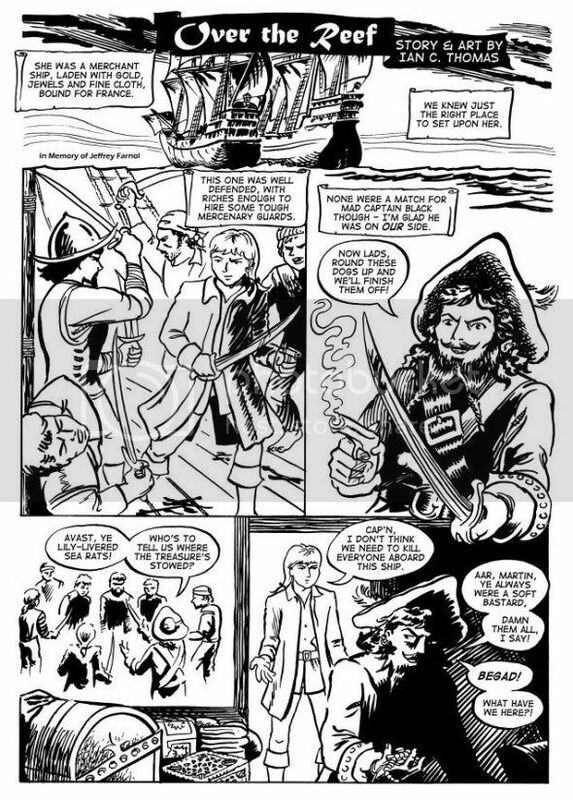 Here's the first page of my five page Pirate mini-epic for the Pirates anthology, which has a deadline of tomorrow. Comments welcomed! I finished this off over Easter, and also got a final draft for the script of Moth & Tanuki #4 done. There was a bit of editing on that M&T, which ended up with me adding 2 pages, so it'll be an 8 pager. Now I'm just waiting on that Bristol board in the mail to get started, but in the meantime I'm working on two other projects that I'm trying to get going. I was greatly saddened to hear of the death over Easter of Paul Hester, Crowded House drummer, singer, songwriter, TV presenter and comedian. I first saw him drumming on the final Split Enz show, when Neil Finn announced that he and Paul would be working together on whatever his next project would be (initially The Mullanes, then later CH). I really enjoyed all his work, particularly his show, Hessie's Shed, on the ABC a few years ago and seeing him on a Wiggles cooking segment on kids TV one-time. The circumstances of his death are particularly grim, and I'm really sorry he lost his battle with depression - a great loss. Frenz.com - Split Enz, Crowded House, etc. Last night I got home to find that a couple of local boys had been throwing rocks on our roof, then they'd gone up the road a bit, turned around and come back for another go, successfully breaking our front window. Jill had followed them back to where one of them lived and had spoken to one of their mothers (a complete waste of time as it turned out - "I choose to believe my son" - the typical empowering criminial codependent). Anyway, it appears our house had been chosen at random, as the real aim was to frame one of their classmates, who lives a couple of doors down from us. Needless to say, we made a Police statement and also contacted their School. I'm amazed (though not suprised) at the parents of these kids. The boys are 11 and 12 and possibly trying this sort of stuff out - evidently with the full support of their parents, who think they can do no wrong. One of them had been sent home from school earlier in the day for some misdemeanour, and various neighbours have stories to tell about these kids, so our experience of them doesn't appear to be unique. They're at an age where kids try things out, but I think they may unfortunately have reinforced to themselves the lesson that crime + lying = success. Another neighbour, who is a glazier, agreed to replace the window for an unbelievably good price, which is wonderful! Of course, there goes some of the money I just made through drawing ):-(. The party for L's birthday went well. Because the day was still and perfect I set the giant board game we'd made up outside, on the deck. The nine girls all brought a toy pony (My Little Pony or similar) and the coloured-coded board worked really well. I suggested they could follow their ponies around the board, but Jill's sister (who was helping out) pointed out that we'd lose track of whose turn it was if they did that, which would have been disastrous! I might post a picture here sometime soon. - Two different public library systems (near work and near home), both have facilities for library patrons to use their catalogue functions online, including renewing books, placing reservations, etc. However, these systems are password based and no password is allocated - you have to ring up and they input your surname as the default. Why not do that in the first place?! Then, once I'd done this at the one near home, I found I couldn't renew books or place holds because apparently I have $3.15 in library fines owing... which has to be paid first! It seems to me that libraries are in critical danger of becoming completely irrelevant and extinct - I hope they don't, but can't help thinking this kind of obstacle-making makes it far more likely. I also found out where I work evening shift on Thursday will be closing for the evening - it being Good Friday the following day - and I'll be working from 10.09am until 6pm. Not 10.08 and not 10.10, but 10.09. I suppose that makes sense to someone somewhere :). On the upside, yesterday I got paid for a couple of pages of comics I'd drawn - I'm overjoyed! This is the first time in twenty years that I've been paid for comics work (though I have been paid for some illustration work here and there). I really enjoyed drawing those pages, so it's just plain wonderful all round! I'm very grateful to the artist who has decided to employ me to this project - thanks, mate, I appreciate your faith in me! Today is my birthday. It's pretty low-key, which is how I tend to prefer it. I guess getting old is a lot about character, whereas being young these days seems to be about personality - quite a difference. I'm still busy organising the games for L.'s birthday party on the weekend. The theme is ponies and we're making a giant playing board. Each child will bring a pony (probably a My Little Pony in most cases, I figure) and we'll make wings for them, play the board game with them, and play Pin the Tail on the My Little Pony, which I made last year. The theme for Operation Funnybone is "fun, creativity and wondrous discovery," so I've submitted the following cartoon, which is kind of relevant. As usual, Jill and I are trying to think up inventive party games for L.'s birthday party, which is on in just over a week. As her friends all seem My Little Pony and Saddle Club obsessed at the moment, the theme is going to be ponies. We handmade the invitations the other night, with L. drawing the covers, and Jill and I drawing/writing the inside parts. Jill came up with a kind of large Pony trek game, with coloured spots and using a coloured dice, with the players using a toy pony as their playing piece. I was thinking of a similar game devised as a horse race, except that it would be over too quickly. I'll probably do the usual stuff as well - pass the parcel, pin the tail on a pony and balloon animals at then end (squeak, squeak, KABANG!). J. 's birthday is going to be more difficult this year, I figure. First off, Dillon Naylor has activated "Comments" on his Batrisha Weblog - and there's an indepth interview on there - so get on over and say something! On a sad note, Aaron Burgess today announced that The Ink #3 has been postponed - seemingly indefinitely at this point - and has given permission for contributors to publish their own work elsewhere as they wish. I have been considering publishing a collected Riffin' to Oblivion, but I don't really want to get involved with the costs and headaches of publication/distribution again at this stage. Aaron's reasons are sound, as he's trying to get a business running, which needs total commitment in these early stages. It is frustating though! I now have 30+ pages of comics "on ice" around the place, with small-press publishers ranging from communicative to completely uncontactable. The saddest case of the latter is Xuan Xuan where the artists are increasingly speculating on the Yahoo list about what might have happened. It's good to be patient though, and I do expect some of these titles - all listed on my Home Page to eventually come to light. After I complete the Pirate story for the ever-reliable Tonia, I think I might give anthology contributions a rest and concentrate on seeking out paid comics work, in addition to what I've already started on. Producing the work for its own sake is fine, and I accept that feedback is fairly limited, but having it never appear after so much effort really is disillusioning. That said, Operation Funnybone really appears to have got up a head of steam, and I'm hoping more and more "unknown" local artists will pop out of the woodwork and join in. There are so many classic pieces already in line for this book! The advertisement appears below and includes the increasingly ubiquitous Moth & Tanuki, which was a surprise! All credit to Glen Shearer, who conceived this project and is working hard to make it happen. The children seem pretty taken with The Prince of Egypt currently. I really didn't think this'd work as an animated film, but it's rather good, if not completely successful. J. has gotten interested in further stories from The Bible, but I'm finding that most children's Bibles are pretty expurgated, and leave out some of the nastier, spicier stories - not surprising I suppose. I think Dreamworks has a good approach to most of their animated films, usually with some emphasis on the male buddies theme - as in The Road to El Dorado and Sinbad (the latter I consider to be a worthy failure). So many of the finest animated films are non-Disney! Miyazaki's works go without saying - My Neighbour Totoro, Kiki's Delivery Service, Spirited Away, Laputa: Castle in the Sky, etc - so they're probably first choice. The last week I've had off work as long service leave - my first break since coming back from secondment to a different University last year, apart from Christmas/New Year, when I was sick with whooping cough. They weren't happy with me taking a week this time of year though. It's been fascinating working in another artist's style - and he's one of the best! To try to maintain the authentic feel of the strip, I've even been using the same pens, though my style does show through in places, I think. Fortunately, I think the way I work is compatible, and I currently work in a number of different genres and styles anyway. What most strikes me is how clean and geometric these pictures are, which can be pretty unforgiving :). It's been strange working back and forward between this, and the Pirate story, which is a wildly loose style, with lots of swirling linework and sloppy spot blacks. Needless to say, I play very different music when I'm working on these two pieces. I also finished reading The Four Wise Men, by Michel Tournier, recommended by my sort-of-brother-in-law. It's really good, and similar in tone and concerns to Life of Pi given that it is very imaginative, often told in the first person (several different narrators), but also with various perspectives, and grapples with religious concerns, along with several animal characters along the way. Apparently, one of his other books is truly horrible, so I don't know if I'll seek out further work by him.